These Apple Bars make for a fast and delicious apple dessert. Scott shows you how to make these dessert bars using apples from your own tree, or market if you’re not that lucky. Apple bars are a fast and easy dessert bar recipe. We’ve been cooking and baking up a storm in our family, over the past few months. 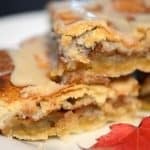 We have featured a few recipes using honey crisp apples from our backyard tree, and quite honestly we could make something new every day of the week with those apples and still not run out. That tree is loaded! With this post, Scott puts together a quick and easy treat that we served to some guest at our cottage last weekend. 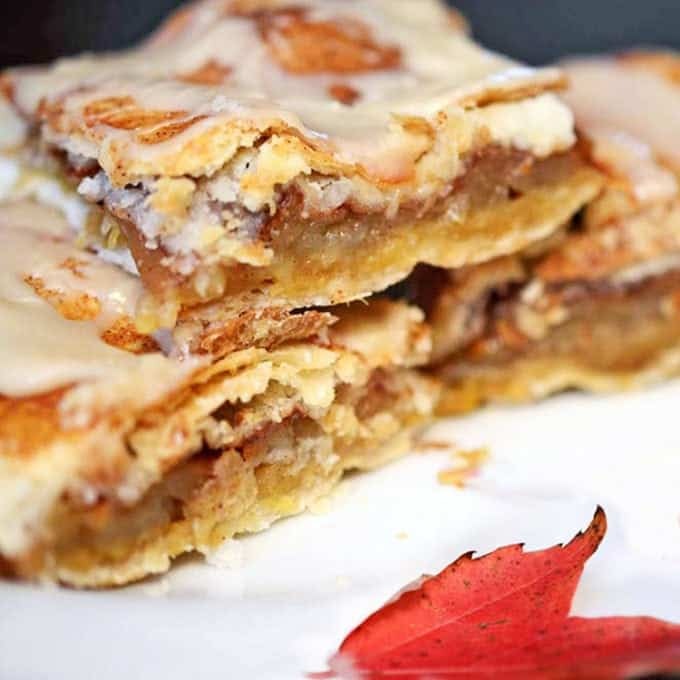 They are seasonal and delicious; they are Simple Apple Bars. 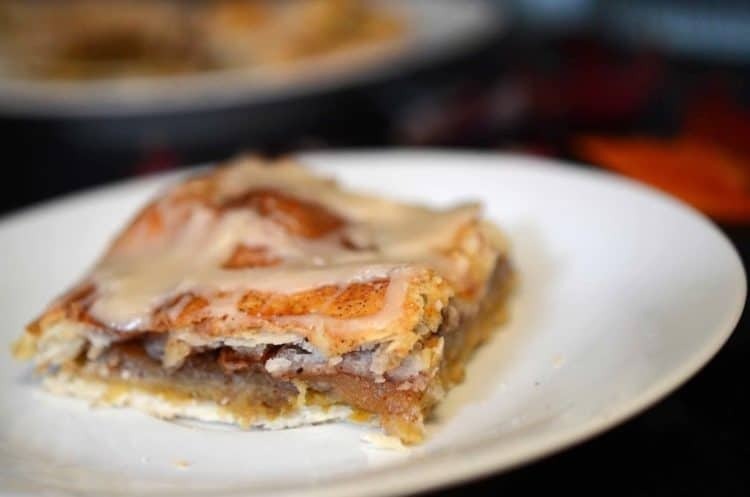 Simple pantry spices go into these apple dessert bars. 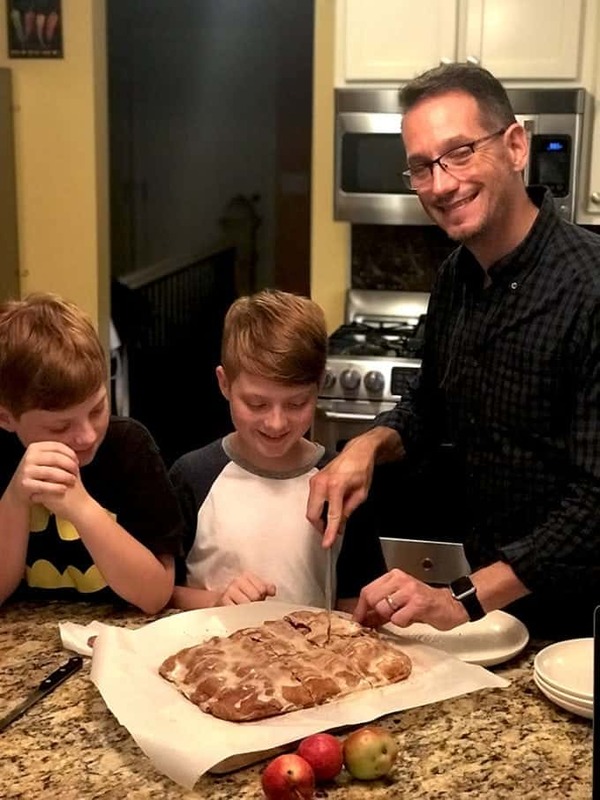 If you have been following Platter Talk at all, you probably know we are a pretty busy family – two working parents, six boys, and an English bulldog. To help ensure that we have almost no idle time at all, we like to spend weekends at our small lake cottage, about an hour from our home in town. I can’t say that we never go out to eat, that would be a blatant untruth. I can say however that we try to eat most of our meals at home, as a family. To that end, we cook. A lot. These apple bars are topped with a simple powder sugar-based glaze. Although we try to focus on fresh and healthy, like many busy families we have learned to appreciate our good friend, Convenience. 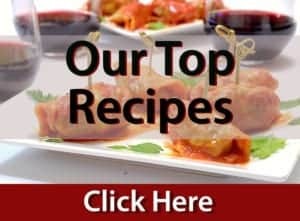 Similarly, I have noticed in the online food world that many people are looking for quick and easy. 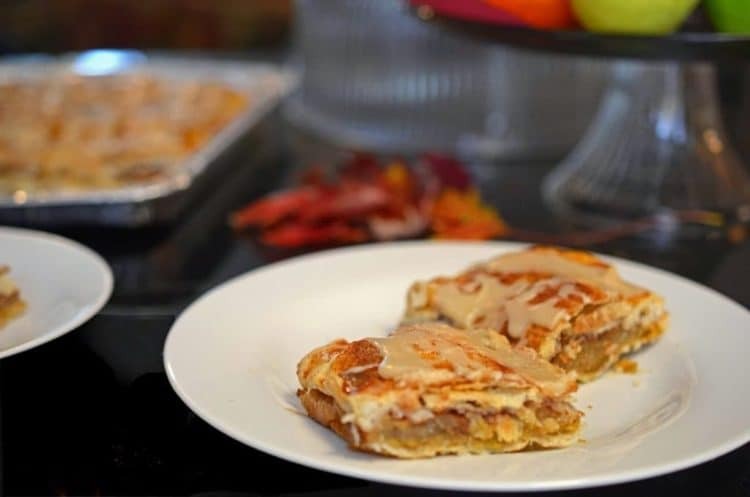 Apple Bars are the perfect way to use fresh apples from the tree. And then, for us, there is the “cottage factor.” I try my best, to articulate it to others by describing our cottage as a state of mind. We don’t go there to work, but rather let our shoulders collectively fall. There are movies, there is fishing, there are nature walks, there are games outdoors and indoors, there are bonfires at night. 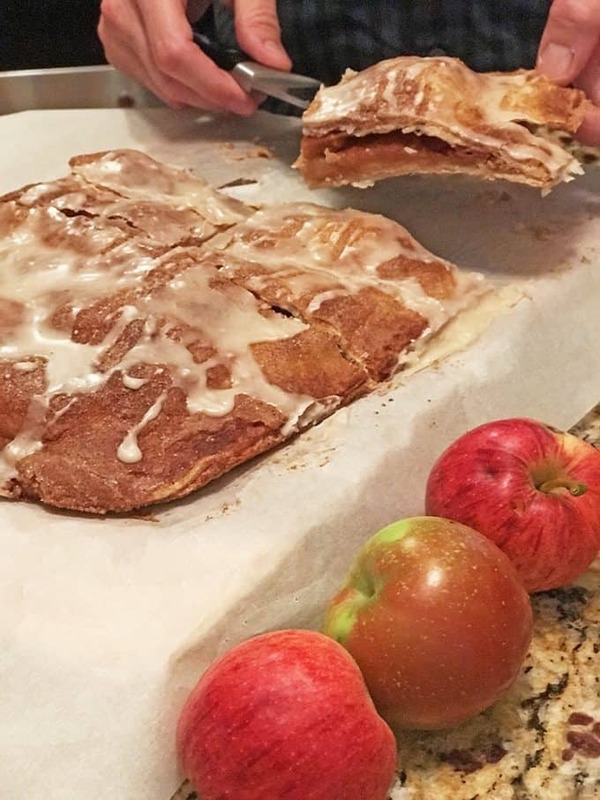 Use corn flakes or a similar cereal for these apple bars. Naturally, there is a lot of cooking there as well; sometimes it is more involved than others. On this day, Scott wanted to use some of our apples from home, but he did not want to make it an all-day affair. Thus, he came up with this recipe for Simple Apple Bars. We served these as a dessert with some vanilla ice cream, last Saturday evening when we had a couple of guests over for a dinner of chicken cacciatore. 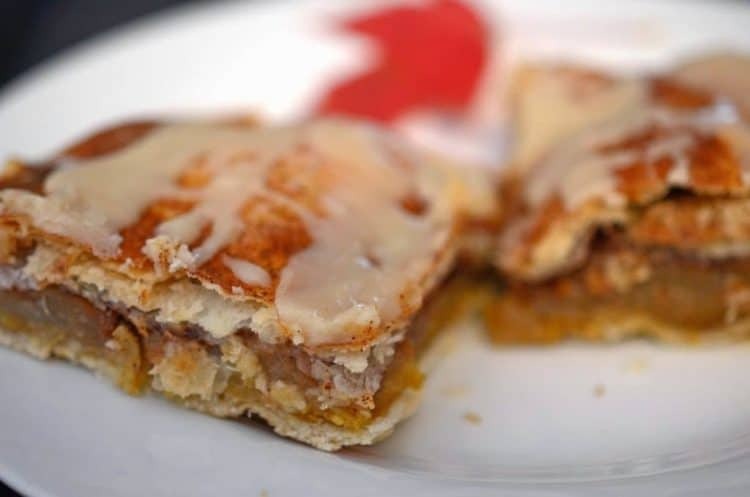 Give these apple bars a try, while the apples are fresh. They are delicious, and they are simple. 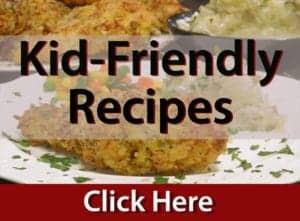 Like Apple Recipes? 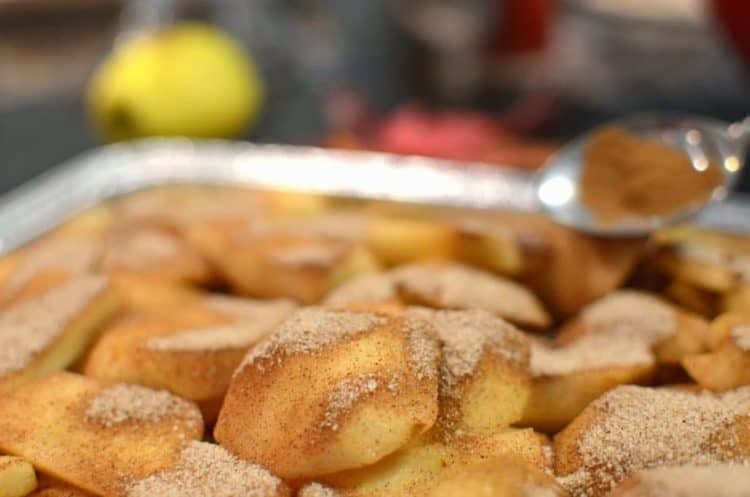 Take a look at some of our other apple recipes! 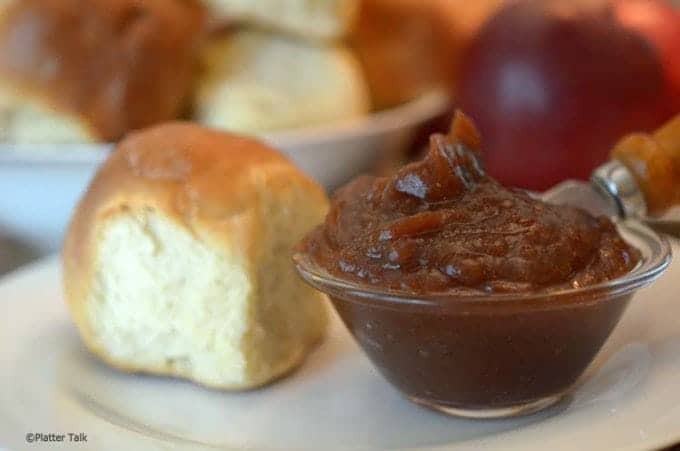 This is our Slow Cooker Apple Butter; you won’t believe how easy and how wonderful this is to make and enjoy! Peel apples and slice in uniform slices approximately 1/4 inch thick. Using a medium size mixing bowl combine sugar, cinnamon, cloves nutmeg. Unroll the pie crust and place on a 9"x13" baking pan or cookie sheet. Using a knife cut the pie crust to fit the pan. Use the cut pieces of pie crust to fill in any empty voids on the cookie/baking sheet. You can "glue" the pieces together by using a wet finger to lightly wet the crust first and then adding the cut pieces to cover the bottom of your cookie/baking sheet. Spread the crushed corn flakes over the top of the pie crust and arrange the apples on top of the crushed corn flakes. Next, sprinkle the sugar mixture over the top of the apples. Reserve approximately 3 tablespoons of the sugar mixture. This will be used to sprinkle on the top crust prior to baking. 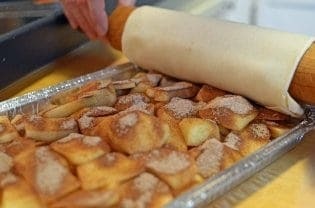 Unroll the 2nd pie crust sheet and repeat the steps above to cover the apple bars. Whisk the egg and brush over the top of the crust. Sprinkle the remaining sugar mixture over the top of crust. Bake for 50 to 60 minutes or until golden brown. Mix powder sugar, vanilla and milk together. Be careful not to add too much milk. 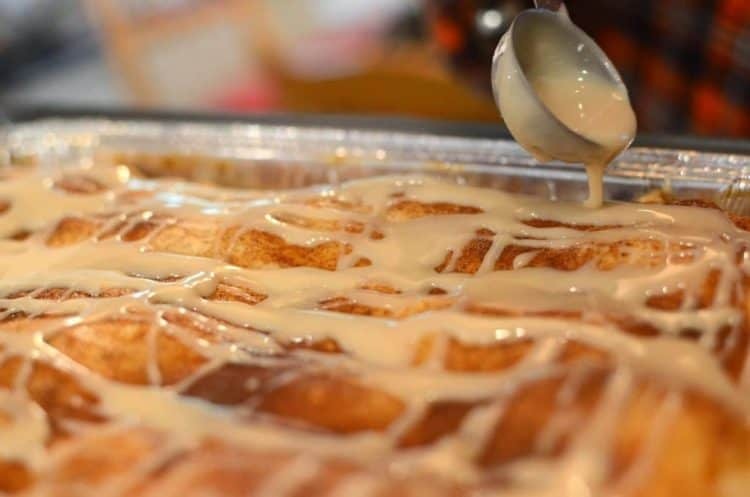 You want the mixture to be smooth and thick enough to drizzle over the top of the bars. You do not want this mixture to be too runny. The glaze can be drizzled over the bars after they have been removed from the oven and cooled for approximately 20 minutes. Allow the glaze to set before servicing. Bars can be served slightly warm or completely cooled. 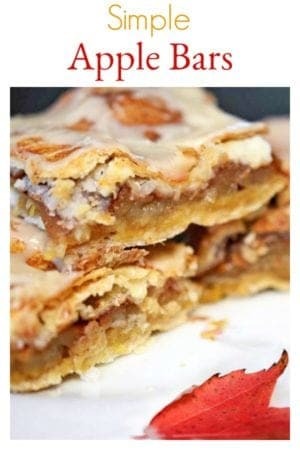 Pin this apple bars recipe for later.